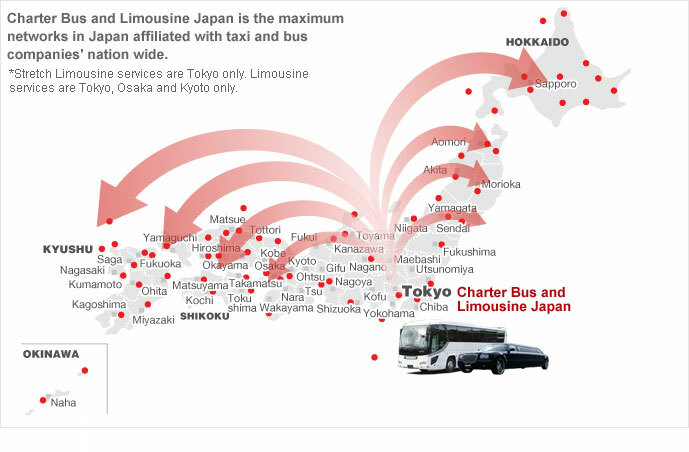 Welcome to Charter Bus & Limousine Japan. We know you must be pretty tired of looking for charter bus and limousine services outside major cities and major airports in Japan or even in big cities like Tokyo, Kyoto and Osaka. We are sorry that most Japanese bus and limousine service companies have Japanese web sites only. But now, you can be free from that worry with our web site "Charter Bus & Limousine Japan", which arranges charter buses, limousines, vans and taxis in any city, any airport and any station in Japan. we can definitely help you find the right bus or limousine catering for your special purposes all over Japan. Our commitment and goal is to provide you with consistent and courteous "Charter Bus & Limousine Japan" transportation services. Please contact us,If you need transportation services for the purpose of business, airport service, sightseeing, tours, or other special events. we can offer a wide range of vehicles to accommodate your needs. Our rates are always affordable and our drivers are always courteous and professional. We understand the importance of getting you to destination safely and promptly, which is a part of why we pride ourselves on being punctual every time. Our services will be delivered with customer satisfaction in mind. Our tour guide was simply amazing. She speaks good English and will entertain all your questions about anything. Very accommodating. The tour was memorable because of her.